TPS Group can assist you in determining needs, recruiting, conducting background checks, interviewing and on-boarding. Hiring the right employees for any company can be extremely difficult and very time-consuming. TPS Group offers Hiring & Recruiting Services so that your company has the quality of employees that it deserves and a team that’s built to succeed. As a company that places the same level of importance on finding and keeping the right people, we get it. Our Hiring & Recruiting team is diligent about understanding your business and your needs. Why Do You Need Hiring & Recruiting Services? We deliver talent, so that you can focus on your business. 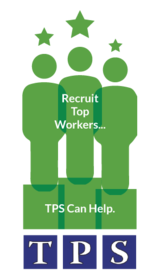 For more information about Hiring & Recruiting Services, Contact TPS Group today.